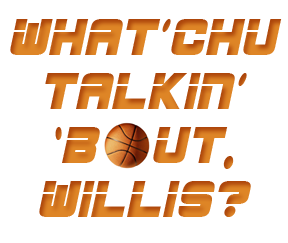 The biggest stage in basketball begins tonight at 7:30 p.m. in Oklahoma City. 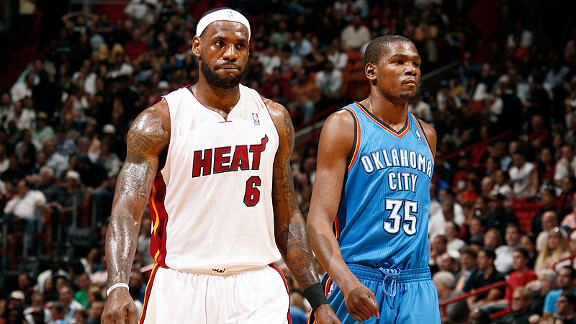 I have said all along that Miami versus Oklahoma City would be my dream matchup and this dream has become reality. You have star power, athleticism, great young coaching, and an intriguing contrast between the cities and the creation of both teams. The Playoffs and NBA Finals are all about matchups and this series will not be any different. I will highlight the key matchups of the series and what I believe will decide the ultimate result. Yes, I understand Fisher does not start, but I believe this matchup will be crucial in this series. Fisher must outplay Chalmers with the minutes he is given. This may sound easy but Chalmers will get plenty of opportunities to contribute seeing as the Thunder will be packing the lane with defenders because of Lebron and Wade’s penetration. Chalmers will get a good amount of shots and he is coming off a good series against the Celtics. Fisher’s experience and minutes late in the fourth quarter will give him a decided advantage in this matchup. Fisher’s big shot ability could alter this series. If you are a fan of big men who do the dirty work then this matchup will not lack entertainment. Both will get good minutes seeing how both teams love to play “small” ball. Haslem is a very good spot up midrange shooter and will need to knock down his shots to open up things for his superstar teammates. Haslem’s confidence could be down a little though, seeing how he was abused by Kevin Garnett in the Eastern Conference Finals. I have to give the advantage to Collison in the garbage man category. Collison does all the things no one talks about but decide rather you win or lose. Collison’s physical nature will be needed in pushing around Bosh when Ibaka is on the bench or in foul trouble. This matchup is not talked about as much as I think it should be. It will be interesting how Bosh attacks Ibaka. The “real” Defensive Player of the Year is an unbelievable shot blocker but not a great one-on-one defender in the post. Fortunately for OKC and Ibaka, Bosh is not a back to the basket big so Ibaka should be able to stick with Bosh on the perimeter. The biggest matchup is who can hit the consistent midrange jumper from 17 to 18 ft.
Ibaka has improved in this category by leaps and bounds, but I have to give the edge to Bosh. Bosh came into the Eastern Conference Finals and consistently hit crucial midrange jumpers and even hit three huge three pointers in Game 7. Bosh makes his money off of his J and I expect nothing different in the Finals. This matchup could sway the Finals in one way or the other. Miami has no one who can guard Harden. They better hope they have some spots in the game where Westbrook is out and Wade is still in — that way he can guard Harden. The great thing about Harden is that even if you do have a great primary defender to stop him the pick ‘n’ roll will negate that. Harden has to dominate whenever he is in the game rather that is playmaking or scoring. Wade will be dedicated mostly to Russ and Lebron will be attached to KD so Harden needs to take advantage. Athletic, passionate, and keen ability to finish at the rim. Would to have loved to see this matchup with Wade being five years younger. Not saying Wade is a senior citizen or anything, but the millions of times he has hit the floor has obviously taken its toll. Russell has an advantage as far as speed and he will need those spry young legs in defending Wade in the post and off pick ‘n’ rolls. I believe Wade will give Westbrook the midrange jumper instead of him getting into the lane. The Heat better hope Westbrook doesn’t get hot because that could cause chaos. I give the advantage to Russell in this matchup because I believe he will be more consistent than Wade, who has struggled to string two or more good games together successfully. One of the greatest matchups the finals have seen since Magic vs Bird. When was the last time the outright number one and number two players face off for the gold ball and bragging rights for the “Best Player in the League” title? Lebron is the Magic: a gifted passer who is someone the league has never seen before. KD is Bird. Great shooter/scorer who comes up big when it matters the most. This matchup is hard to pick because both players will give their all and will come up big for their teams. As far as an individual matchup, I give the edge to LeBron because he is arguably the best offensive and defensive player in the league which hasn’t been achieved since MJ. I just believe Lebron will change the momentum of games on the defensive end more than once in this series. That is why I am choosing the Heat in 6.